When the mouse is moved over the ImageButton, we want the button to look as shown in the image below. When the mouse is not over the ImageButton, we want the button to look as shown in the image below. 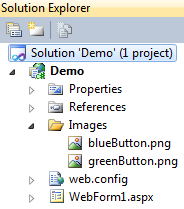 Add a new folder to your web application project. Name it Images. Copy the 2 images you have downloaded in this folder. Add a web page to your project. At this point your Solution Explorer should look as shown below. I think "~" sign is a special character that is usually used to set URL paths for Asp.net Server controls and this character instructs the Asp.net run time to resolve the relative path of the server control. In short and Simple "/Images/blueButton.png" is Searching a folder under WebForm1.aspx but for this you should go to one directory up to the root directory i.e. "~/Images/blueButton.png". "~" sign refers to the root directory. SIR, Can you please make videos on WPF?